Royal Enfield MD & CEO Siddharth Lal has just announced the price of Royal Enfield Continental GT in India at Rs. 2.05 Lakhs On-Raod Delhi, Rs. 2.14 Lakhs on Road in Mumbai and Rs. 2.04 Lakhs on road in Goa. It has been launched in two attractive colours- Red and Yellow. Along with the Continental GT Cafe racer, Royal Enfield has also launched a range of RE branded accessories in from top brands in the industry. These accessories will include riding gear like shoes, helmets, t-shirts, jackets etc. 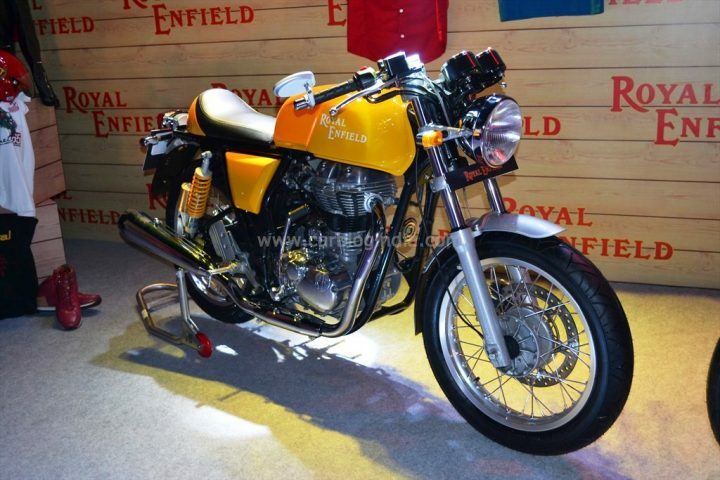 Royal Enfield had us all excited when it first showcased the Cafe Racer Concept at the 2012 Indian Auto Expo. The bike harked back to the 1965 Continental GT 250 and was unlike any other bike in Royal Enfield’s lineup in India. It has been more than a year and a half since then, and now the company has announced that the Royal Enfield Continental GT 535 will be launched in India between November 25, 2013 to November 28, 2013. By definition, a cafe racer is a light motorcycle with a adequately powerful engine which is built for handling and speed rather than comfort or cruising ability. The earliest cafe racers were hand-built ones, combining the powerful engines with better handling chassis. Cafe racers are characterised by clip-on handle bars, rear-seat footpegs, an long fuel tank with recesses for the riders legs and a humped seat. In short these were cheap to own-and-maintain, powerful, and agile racing bikes meant for the road, and were at home on the track too. Motorcycle companies realised the popularity of this design and decided to launch their own off-the-shelf cafe racers. The 1965 Royal Enfield Continental GT 250 was one of the fastest cafe racers to be produced at the time. Powered by a 250cc engine producing 21 BHP, it set a speed record at the time of about 119 KMPH in Britain. These factors helped the bike become pretty popular in the country. The interest in cafe racers slowly waned when companies started restyling their bikes without making them performance oriented. The Continental GT 535 continues where the 250 left off, it combines the look and feel of the old bike with new-age technology. In the U.K, the Royal Enfield Continental GT 535 is priced at £5200 (approx Rs. 5.12 Lakh as on 17th October 2013). According to reports, the bike will be priced about the Rs. 2 Lakh mark in India. The Royal Enfield Continental GT 535 combines retro design elements with modern touches; Things like the round headlight, elongated tank with the classic Royal Enfield badging and a chrome fuel-filler cap, rear-set footpegs, clip-on handlebars, spoke wheels, trimmed mud-guards, a simple seat with a rear hump etc. would be home in the 1960s. And there is the abundance of chrome to consider too. The switchgear, disc brakes, shocks, the digital gauges on the other hand are modern. Small touches make this bike unique, the rear-view mirrors at the end of the handle bars look cool, the up-swept exhaust is different, the exposed frame is beautiful to look at, the seat (single seater standard and double as option) with exposed stitching is rarely seen on motorbikes today, all in all it the bike is simple and easy on the eyes. The Royal Enfield Continental GT 535 is the most powerful bike that the company has ever produced. The base 500 cc engine found on the Bullet Classic 500 has been tweaked and the engine capacity increased to 535 cc. It produces 29 BHP @ 5100 rpm and 44 Nm of torque @ 4000 rpm, which 2 BHP higher and 3 Nm higher than the 500 cc unit. The Continental GT is the lightest bike to be made by the company at 184 Kg, and this makes the bike more sprightly than any other bike in the company’s stable. Most reports suggest that the bike can achieve a top speed of about 160 KPH, but is best left cruising at around the 120-140 KPH mark as the vibrations at higher speeds can be tiring. The engine is tuned so that it can be given the beans, running out of breath competitively higher in the rev band than other bikes from RE. Couple this enthusiastic engine to a smooth 5-speed (one down, four up pattern shift) transmission and you get a riding experience like no other RE. Further encouraging the sporty riding is the dual-tube frame tuned by famous British racing parts developer Harris Performance Products. The 18-inch rims (with alloy spokes) are shod with 100 mm section tyres at the front and 130 mm tyres at the rear. These are Pirelli Sport Demon tyres, which are quite grippy and rated for 210 KMPH. Suspension duties at the front are handled by 110 mm forks at the front and 79 mm gas-filled shocks from Paioli at the rear. This leads to a stiffer ride,which coupled to the short wheelbase makes the Continental GT very maneuverable. Braking duties are handled by 300 mm discs with twin-pot calipers sourced from Brmabo at the front and 240 mm discs with single pot caliper at the rear. The Royal Enfield Continental GT 535 is not a scorcher of a bike, it is rather a style statement. It does allow the rider to corner harder, drive faster than any other RE bike but it cannot match other modern 500 cc (or sub 500 cc) bikes in terms of absolute performance. The Continental GT is supposed to be driven like any other bike from Royal Enfield, cruise at high speeds for hours upon hours, but because of it’s unique styling and rider position you look fast whether you’re standing still or cruising at a 140 KPH. 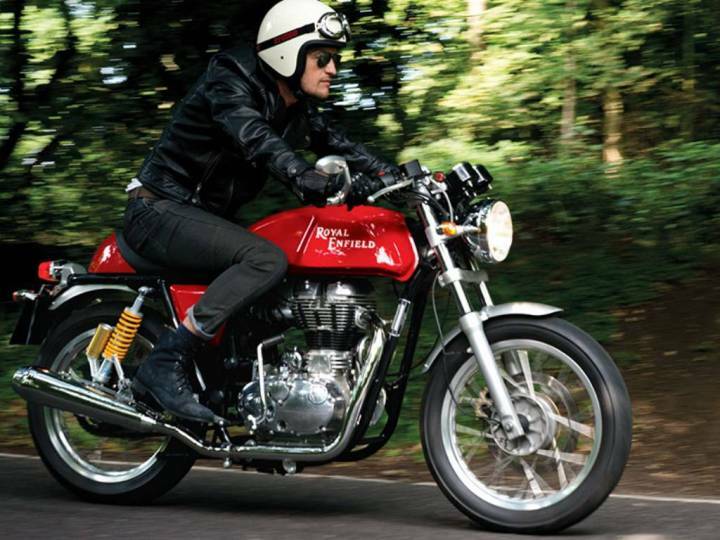 We will keep you posted about the Royal Enfield Continental GT 535, keep following this space.